Any Size11" x 17"4"x4"7" x 12"7"x11"7"x7"9"x11"9"x9"
Isopropyl alcohol is often the cleaning solvent of choice in cleanrooms and controlled environments because of its ability to remove a wide range of contamination from interior and exterior surfaces. When maintaining the integrity of your cleanroom, it is essential to equip yourself with the best material available. One of the most effective ways of dealing with surface contaminants is to use wipes that are already saturated with your solvent of choice. Pre-saturated, pre-wetted, or presaturated wipes? Those are all terms used when referring to cleanroom wipes that are impregnated with a cleaning agent such as isopropyl alcohol. They provide a highly effective cleaning medium for contaminated interior and exterior surfaces within your cleanroom environment. Although these wipes can contain a variety of solvents, the most popular is IPA (isopropyl alcohol). Ease of use: Wipes that are presaturated are more user-friendly than the standard option, which is to impregnate individual wipes with a diluted agent. This diluted agent may be too concentrated or not concentrated enough. Using wipes that are pre-wetted saves time and fuss and ensures the IPA percentage will be accurate. 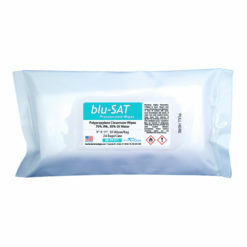 Economic: pre-saturated cleanroom wipes come in packages that help prevent premature evaporation of the cleaning agent. They’re also standardized with the optimal amount of cleaning agent within, ensuring that there’s no wastage and that the wipes are used to the full. Fewer volatile organic compounds (VOC): by removing the need for a sprayer with the requisite cleaning agent, pre-saturated wipes remove the element of VOCs from the equation. This ensures a more sterile and secure cleanroom environment. It also allows you to use the cleaning agent exactly where you want it, instead of spraying a surface. Safety: by removing the flammable spray from the equation, presaturated wipes provide a safer working environment and cut down on possible fire hazards. They also remove the hazard attached to employees when mixing potentially hazardous chemicals.By negating the need for a sprayer filled with the cleaning agent, pre-wetted wipes cut down on staff exposure through skin or inhalation to such chemicals. Convenience and efficiency: pre-saturated cleanroom wipes remove the need for employees to spend their time preparing and diluting cleaning agents. Therefore, they help concentrate the efforts of valuable staff members towards more worthwhile activities within the cleanroom. 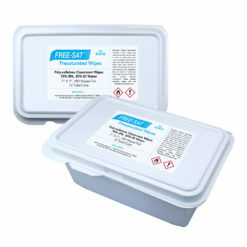 Whatever your cleanroom needs, give pre-saturated wipes a try. The ensuing result will speak for itself. For further advice or information on pre-saturated wipes, don’t hesitate to contact us.